Natalie Sabga escorts President Anthony Carmona to the launch of the John E Sabga Foundation for Pancreatic Cancer at Prime Restaurant, Port of Spain on November 16. At right is Peter George, chairman of the foundation’s board. PHOTO COURTESY SCOTT MCDONALD. Natalie Sabga recently started a one-man fight against pancreatic cancer, a disease that spares no one. “It robs the patient of body, soul, mind and eventually dignity,” says the young widow of John Edmond Sabga, who, at the age of 56 lost a ten-month battle with pancreatic cancer in January. After putting her beloved husband to rest on January 31, the bereaved woman has devoted her time to assist in defying the odds and beating this deadly disease. 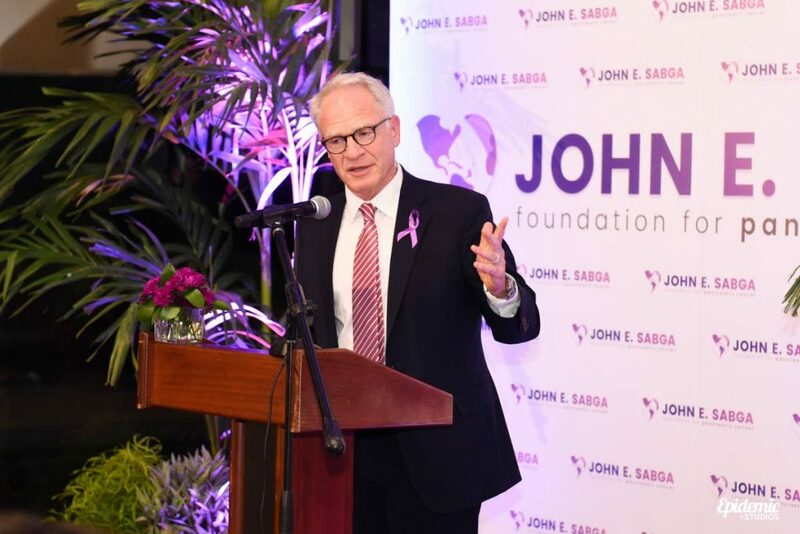 She launched the John E Sabga Foundation for Pancreatic Cancer on World Pancreatic Awareness Day, November 16, at Prime Restaurant, BHP Billiton building, Invader’s Bay, Port of Spain. 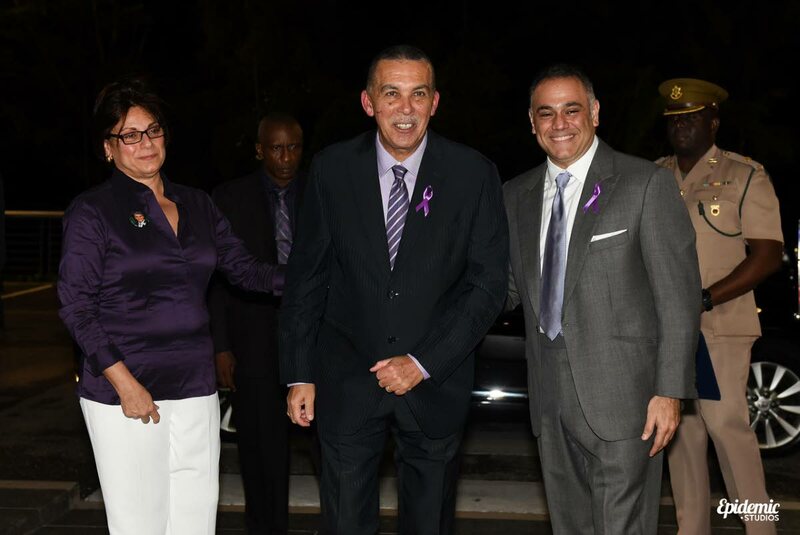 Leading up to the event, which was attended by President Anthony Carmona, Natalie had decorated the restaurants with which her husband was associated, Trotters, Buzo, Prime, Panini Cafe and Sticky Bones in purple – the colour for pancreatic cancer awareness ­– and all staff wore purple and white T-shirts with words and badges in memory of their late boss. The guest speaker at the launch was Michael Bassoff, president of Translational Genomics Research Institute (TGen) Foundation in the United States. Professor at TGen, Dr Daniel Von Hoff, was one of the specialists who had treated John in Miami, Houston and Dallas. Dr Von Hoff and his team were the final ray of hope for John at their clinic in Honorhealth, Scottsdale, Arizona. “Here he received unprecedented treatment with patience, love, kindness, understanding, compassion and humility. Like none we had experienced anywhere else,” Natalie said. Michael Bassoff at the John E Sabga Foundation launch. PHOTO COURTESY SCOTT MCDONALD. Pink is the colour of breast cancer awareness. An immediate goal of the foundation is the John E Sabga clinical trial for pancreatic cancer, one of six clinical trials in TGen’s final assault initiative being conducted in Arizona. Advances against the disease made possible by the Sabga clinical trial, and any of the five trials which are part of the final assault will immediately be available to patients in TT. Matthew Sabga, Derrick Lewis, Kern Crosby, Amado Duarte, Professor Anne Marie Bissessar and Helen Yousef, who had all recently lost loved ones to pancreatic cancer, were invited to light candles in their remembrance, while Kevon Carter and Tricia Lee Kelshall paid vocal tribute. The evening ended with cocktails at Prime Restaurant. Reply to "Natalie’s war on pancreatic cancer"